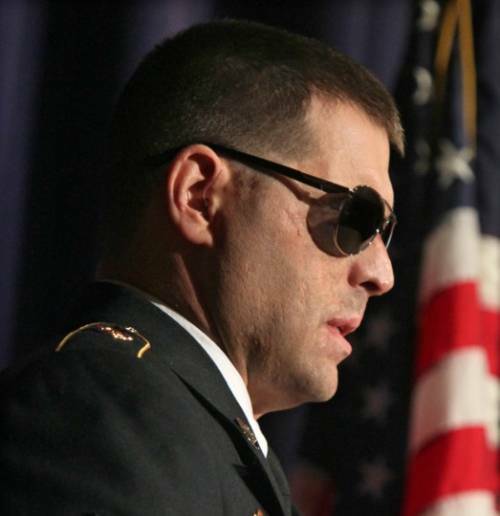 In December of 2011, SSG Aaron Hale, of the 760th EOD (explosive ordnance disposal), approached an IED which he had worked on from a distance using a robotic device. He was about 30 feet away when it exploded, sending shrapnel everywhere. Every bone in his face was broken, and he had severe burns to his face and upper thighs. His right eye was ripped out in the blast, his right eye lids were fused together from the severity of the burns, his left eye exploded leaving half in the socket, and his left eye lids were torn. Exploratory eye surgery to remove shrapnel and assess the extent of his injuries concluded that he is completely blind. SSG Hale's skull was cracked and leaking spinal fluid, his carotid artery was nearly severed with shrapnel piercing it, both eardrums were completely blown out, his sinuses were crushed, and his nostrils were torn. Despite suffering severe injuries and being left sightless, SSG Hale, who landed on his hands and knees after being sent airborne, felt to see if all his limbs were intact, and then got up and tried to find his way back to his unit. A medevac unit arrived 10 minutes later, and SSG Hale passed out. He was unrecognizable; his face and head swollen beyond belief, he was bloodied, and the cuts and burns were horrendous. Thankfully, SSG Hale's long-term prognosis was good. After a month at Walter Reed, and two weeks at the Veterans Hospital in Tampa, he was sent to the to a VA Medical Center in Augusta, Georgia which specializes in blind rehabilitation. SSG Hale received a home in Santa Rosa Beach, Fl.